Osprey Falls is a waterfall on the Gardner River in northwestern Yellowstone National Park in the United States. 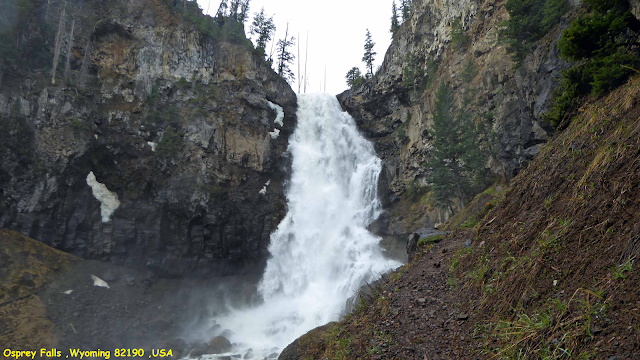 Osprey Falls has a drop of approximately 150 feet (46 m). The falls are located within Sheepeater Canyon and are reachable via the Osprey Falls trail. Osprey Falls Trail is a 7.4 mile moderately trafficked out and back trail located near Yellowstone National Park, Wyoming that features a waterfall and is rated as moderate. The trail offers a number of activity options and is best used from March until October. Directions from Mammoth: Travel 4.7 miles south. Immediately past the Golden Gate Bridge park on the left in the Glen Creek Trailhead parking lot. Begin on the Old Bunsen Peak Road Trail.